Providence Players announces auditions for its final production of the 2011-2012 season. Rehearsals will begin in mid-April, although a few will be scheduled prior to that date on days that accommodate the actors’ schedules. The play is set in Andrew Wyke’s living room in his large Norman Manor House in Wiltshire. The play opens with Andrew Wyke reading the final pages of his latest detective story. The doorbell rings and Andrew welcomes in Milo Tindle, a young travel agent who has come at the request of Wyke. They chat for a while–mostly Wyke asking Milo questions of his background, work, etc. Milo, taken aback by the directness of the question confirms that he does. He tells him that they intend to live together. He goes on to tell Wyke that he and Marguerite know that he has a mistress. Wyke tells Milo that he is welcome to Marguerite but informs him that she would be expensive to keep. Could he keep her in the lifestyle to which she has been accustomed with him? Can he afford to keep her? Milo explains that their relationship is based on love, and that once she’s left him she’ll be happy. He tells him that he can look after her. Wyke tells Milo that Marguerite will ruin him. Therefore he has invited Milo over to discuss a way which will help him out. He tells him that he bought Marguerite a considerable amount of jewelry. In fact it was really a tax avoidance purchase and the jewelry (with receipts) really belong to him. He would allow Marguerite to wear it occasionally. Milo is intrigued. Wyke tells him that he should steal the jewelry that night while Marguerite is away. He can then sell the jewelry to a fence (one known and arranged by Wyke) and live happily ever after with Marguerite and the money. Wyke can then claim on the insurance and then settle down with his mistress. Milo isn’t convinced and questions Wyke’s knowledge of committing crimes. Wyke reminds him that he is an author of great detective stories and his detective St. John Lord Merridew is one of the greatest of them all. Milo disagrees. Wyke reminds him of the money and eventually convinces him it will work. Milo agrees to steal the jewels from the safe which is under the stairs. Wyke explains that they will make it look like a burglary but first though, Milo must dress up in a disguise to avoid leaving any clues. He pulls out a large basket and pulls out various costumes for Milo. …And on it goes. There are many surprises and twists. Auditions will also consist of cold readings from the script. No roles are pre-cast. The James Lee Community Center Theater is located at 2855 Annandale Road, Falls Church VA 22042. The cast age requirements are somewhat flexible. Men of all ages are encouraged to audition. Andrew Wyke is “…a strongly built, tall, fleshy man of 57, gone slightly to seed. His fair hair carries on it the suspicion that chemical aid has been involved to keep the grey at bay. His face, sourly amused and shadowed with evaded self-knowledge, is beginning to reflect the absence of constant, arduous employment.” Andrew is an immensely successful mystery writer. His home reflects his obsession with the inventions and deceptions of fiction and his fascination with games and game-playing. He lures his wife’s lover, Milo Tindle, to the house and convinces him to stage a robbery of her jewelry, a proposal that sets off a chain of events that leaves the audience trying to decipher reality. Milo Tindle is “…about 35, slim, dark-haired, and of medium height. He has a sharp, sallow face alive with a slightly Mediterranean wariness. Everything about him is neat from his exactly parted hair to the squared off white handkerchief in the breast pocket of his blue mohair suit.” Milo has to also convincingly disguise his voice and mannerisms in order to play characters Inspector Doppler, Police Constable Higgs, and Detective Sergeant Tarrant. He comes into Andrew Wyke’s life because he is having an affair with Wyke’s wife, Marguerite. Milo, who is younger than Wyke, is ensconced in the romance of his affair. Both actors have to be able to learn a lot of lines, and work a lot of sub-text moments. They must therefore be comfortable with silence. British accents are desired. Ages are approximate, but the actors who play these characters must be able to pass for the approximate ages. The portions of the characters that come directly from the author are in quotes. 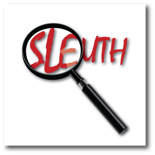 just finished a run of Sleuth in the Tri-Cities (Washington State). Andrew was the heaviest line load I’ve had in over thirty years in community theatre. Got standing O’s though. Best of luck! !